President, and CEO of Women Who Rock, Elena Mayer was interviewed by Alex Letourneau, during the coverage of the PDAC 2015 event. To watch the video of the interview, please visit Kitco News. 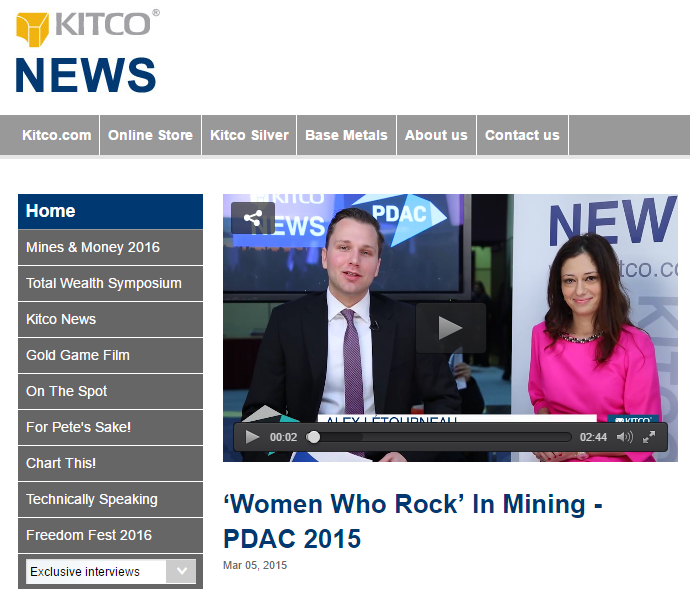 “Kitco News continues its coverage of PDAC 2015 with Elena Mayer, founder of ‘Women Who Rock,’ a social club for women in the mining industry. Mayer also works in mining for PwC and shares her experiences as a woman in the sector. “Women now represent [only] 10% of the industry,” she says, adding that although the number is growing, it is still quite small. Mayer says she decided to found her own organization after meeting with women at PDAC 2014, and continues to find opportunities, one of which includes an auction event with big names in the mining space. This auction included Pierre Lassonde, Rob McEwen and others, who were all willing to offer mentorship time to the individuals participating in the event. “This idea of auctioning mentorship time actually turned out to be pretty successful,” Mayer says.